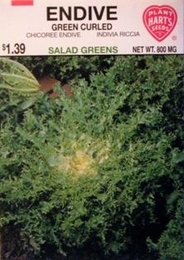 This gourmet salad green is often found in mesclun where it adds a sharper flavor. Usually grown as a salad green, it may also be cooked and served with a sauce or grated cheese. Leaves are finely cut, rich green blanching to a creamy white near the center. To blanch center leaves, tie outer leaves together 2-3 weeks before harvest. Tastiest crops are timed for harvest during cool fall weather. Plant Endive with lettuce and other greens to make your own mesclum mix.